Angry Eyes Lady was an as-yet unnamed agent that assaulted the Ninth Tower in an attempt to claim the body of the Sharess, alongside her partner, Sad Mask Lady. For the purposes of this article, she will be referred to as Aneyla and her partner as Samala. Aneyla was outwardly a tall female drowolath with a lean build and tainted eyes. Her true nature was that of a living summon, the core of which appears to have resided in her lower torso. She had long white hair drawn back into a loose ponytail. She wore a plain suit of white armor with a large white cloak, and wore a plain white mask that concealed her face's features save only her eyes. As weapons, she used a longsword and clawed gauntlets. In personality, she was both brutal and pragmatic. She initially ignored the presence of a pair of non-combatants owing to a need for haste, yet swiftly turned her attention upon them once they became obstacles, threatening to prolong the death of her captive unless her demands were met. Though her faith in her 'immortality' left her haughty and self-assured, her composure swiftly shattered when it was revealed her enemies were fully aware of how to truly destroy her. Aneyla tends attempts to breach the sarcophagus of the Sharess. Aneyla first appeared as she and her partner launched a bold raid upon the Ninth Tower of Orthorbbae, intent on accessing the preserved body of the Sharess. Having distracted the majority of the residents with a demon containing a shard of the Demon God, the pair were able to reach the elevator to the hidden tower undetected. Upon ascending to the tower, they immediately entered the stairway to the upper level of the tower, cutting down any golems barring their path. The only living occupants in the two encountered were Diva and Lil'turtle, who had heard noises from the levels below, causing Diva to descend the staircase to investigate. Not considering either a threat and pressed for time, Aneyla sprinted past without a second glance. Destroying the last remaining golems in the chamber housing the body of the Sharess, the two agents were confronted by Diva, who attempted to convince them to stand down. 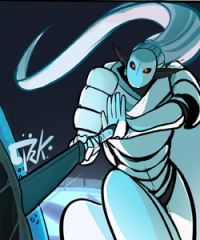 Ignoring her pleas and allowing her partner to deal with the interruption, Aneyla swiftly set upon the crystal sarcophagus, attempting to pry it open with her sword. Finding her initial efforts unsuccessful, Aneyla ordered her peer to refrain from killing the now gravely-wounded Diva; a protection that Samala did not extend to the child in her care, plucking the child from floor and tossing her down the stairwell. As Aneyla's further attempts had proven unsuccessful, she ordered Samala to drag Diva before her, ordering the wounded woman to open the sarcophagus. As Diva refused, Aneyla coldly threatened her with a prolonged death. 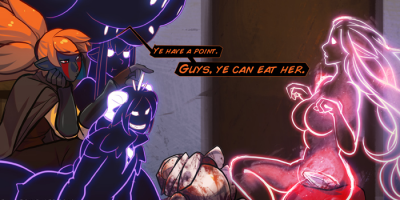 Kiel feeds the summon of Aneyla to a group of her friend demons, including Njack. Before Aneyla could make good upon her threats, Sil'lice ascended the staircase holding a battered Lil'turtle. Though Samala attempted to engage this new threat, she was swiftly dismembered by a combined attack from Sil'lice and Kadara, who had entered the chamber from the opposite stairwell. With her partner slain and Sil'nua also entering the chamber, Aneyla haughtily boasted that the pair would both be reborn, and her assailants were powerless to prevent their return. To her shock, Sil'nua calmly extracted the bloodied summoning core from the corpse of Samala, tossing it to his mother to shatter as he informed Aneyla that the Sharen exiles had encountered and destroyed such abominations before. Cornered and with her vulnerability exposed, Aneyla forced her way past the three Val'Sharen to the stairway beyond, using earth sorcery and the presence of Lil'turtle as a distraction. Though able to withstand the sorcery of her pursuers long enough to reach the entrance of the tower, she found the elevator already descending, having been remotely activated by Diva using a golem the two agents had missed during their initial assault. Sheathing her sword, Aneyla fanatically continued to declare her kind's immortality as she leapt to the platform below. Despite an apparent attempt to slow her descent with sorcery, she landed with a bone-shattering impact. When the lift reached the lower level, Aneyla's broken corpse was greeted by Kiel and her associates, who had deduced the presence of attackers invading the tower. Unfortunately for Aneyla, Kiel was not only aware of her nature, but also an immensely talented summoner. Reasoning that her enemy was akin to a summon with a body, Kiel used the Aneyla's core to create a incorporeal summon of the hapless agent, intent on interrogating her for information. Though Kiel was successful in her effort, Nau quickly pointed out that Aneyla's lack of a body precluded her ability to speak. Conceding the point and seeing no further value in her prisoner, Kiel casually had her summons devour Aneyla, resulting in her true destruction. "We. Are. Immortals." - Moments before leaping to her death. Early concept sketches for Angry Eyes Lady and Sad Mask Lady, Chapter 55.